About a year ago I moved to a patch of scrubland (I live in a housebus) that I felt could be a place I could put roots down for a while. It is behind a barn on a farm here in the UK owned by a friend of mine, and although I couldn't do anything extreme he said I could do what I liked as long as it wasn't permanent. I had previously seen on one of the "permaculture" style pages I frequented someone had suggested using old car tyres as a structure for making an area dotted with small natural ponds, burying the tyre and using a pond liner. I decided to take it to an extreme and used an old tractor tyre that my friend had sitting around, building up the edges so that should he want to - he could one day drain the pond, remove the rockery and simply move the tyre - thus leaving no trace if he was so inclined. A year later we set upon our first "prove the system works" aquaponics endeavour, something I had been dreaming of since I moved here.. And as much as I enjoy working on the larger scale system across the farm I felt I was missing a trick with my own nature pond. 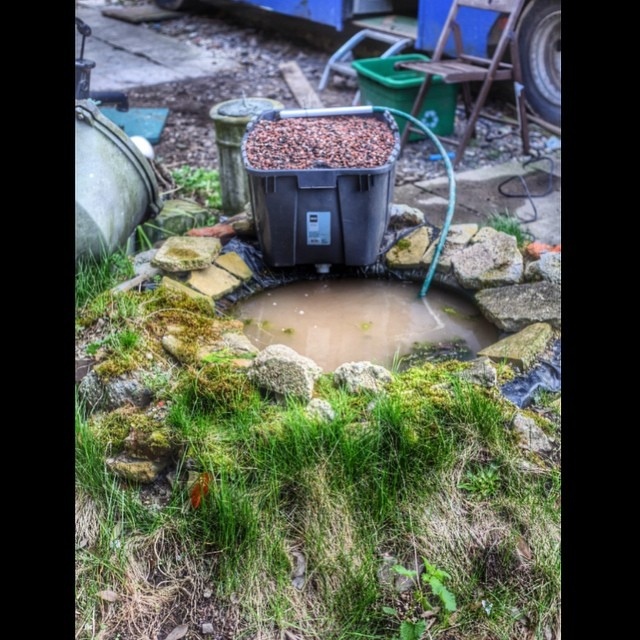 So, using parts scrounged from the farmyard, some cheap potting gravel from the local garden centre and an insanely cheap 800LPH pump (all of £10), the £20 mini-aquaponics setup was born. Originally the nature pond had four blue Orfs living inside it to keep the mosquito population down, but once the system was set up I convinced a buddy of mine in the aquatics trade to give me another five blue Orfs, and over the last two months another twenty 2" goldfish and a shibunkin have also joined the ranks. I had also been given a large fake "hand pump for a well" water feature a year ago and recently realised I could make it work with the pump, which added a little more aesthetic appeal to the setup. Plants are Swiss Chard, Pak Choi and Romanesque Broccoli (Gotta love geometric veg!) and all seem to be quite happy! Lastnomad, small or no you're giving it a go. Curious about R2D2 mounted on top of your vintage pump there? Or is it a helmet? I was also wondering if you have plumbed the trough against the wall into your system and how you have managed the fill and drain of that curvaceous black tub growbed of yours. I was thinking that 800l / hour pump would empty your little tyre pool pretty quickly if you weren't careful. I hope it all goes well for you, causing an end to your nomadic life. (Swap the bus for the property and wish your friend well before he disappears into the distance).